As always, the poets are right. 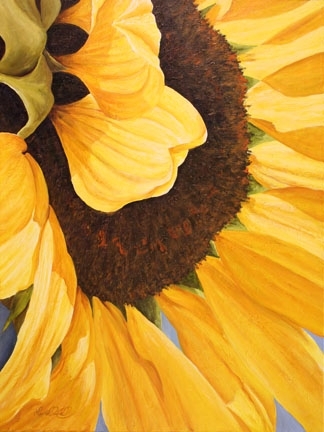 “Deep in their roots,” says Theodore Roethke, “all flowers keep the light.” Come spring in the radiance of that blossoming, even if only for a brief moment in the morning sun, we know that nature is not indifferent to us. See infinitude of galaxies distilled in one dewdrop on a pink petal, taste and see how God is good, how Nature nurtures, how credo becomes scio, how the beginning of the world is in that morning, how Wisdom is there, “moving more easily than motion itself, . . . a radiance that streams from everlasting light, the flawless mirror of the active power of God, and the image of His goodness”: yes, all in a dewdrop, and no brief history of time is she. Stephen Hawking take note! From big bang to black holes, flowers are the hieroglyphics of nature with which, so Goethe reminds us, Nature tells us how much she loves us. We visualize a plant as it roots in the earth, as leaf by leaf sprouts forth, as its blossom unfolds, and now we think of a human being beside this plant. We make the thought alive in the soul of how he has characteristics and faculties which, when compared with those of the plant, may be considered more perfect than the latter. 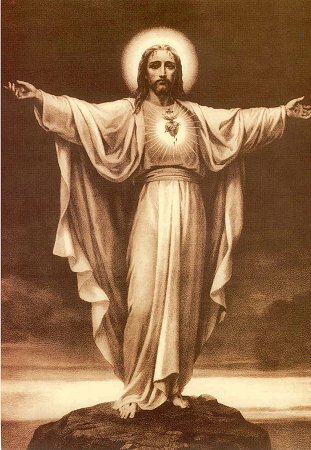 We contemplate how, according to his feelings and his will, he is able to move about hither and thither, while the plant is chained to the earth. Furthermore we say that the human being is indeed more perfect than the plant, but he also shows peculiarities that are not to be found in the plant. Just because of their nonexistence in the plant the latter may appear to me in a certain sense more perfect than the human being who is filled with desire and passion and follows them in his conduct. I may speak of his being led astray by his desires and passions. I see that the plant follows the pure laws of growth from leaf to leaf, that it opens its blossom passionlessly to the chaste rays of the sun. Furthermore, I may say to myself that the human being has a greater perfection than the plant, but he has purchased this perfection at the price of permitting instincts, desires, and passions to enter into his nature besides the forces of the plant, which appear pure to us. I now visualize how the green sap flows through the plant and that it is an expression of the pure, passionless laws of growth. I then visualize how the red blood flows through the human veins and how it is the expression of the instincts, desires, and passions. All this I permit to arise in my soul as vivid thought. Then I visualize further how the human being is capable of evolution; how he may purify and cleanse his instincts and passions through his higher soul powers. I visualize how, as a result of this, something base in these instincts and desires is destroyed and how the latter are reborn upon a higher plane. Then the blood may be conceived of as the expression of the purified and cleansed instincts and passions. 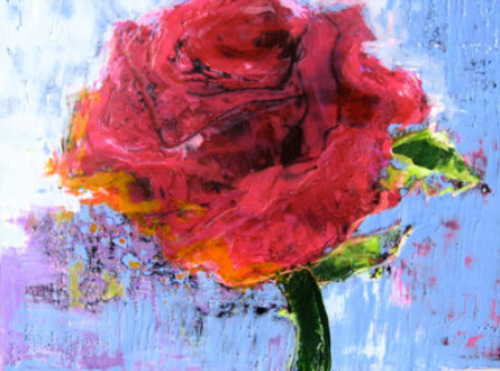 In my thoughts I look now, for example, upon the rose and say, In the red rose petal I see the color of the green plant sap transformed into red, and the red rose, like the green leaf, follows the pure, passionless laws of growth. 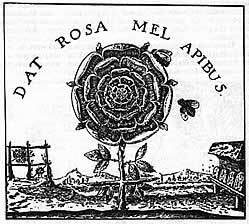 The red of the rose may now become the symbol of a blood that is the expression of purified instincts and passions that have stripped off all that is base, and in their purity resemble the forces active in the red rose. I now seek not merely to imbue my intellect with such thoughts but to bring them to life in my feelings. 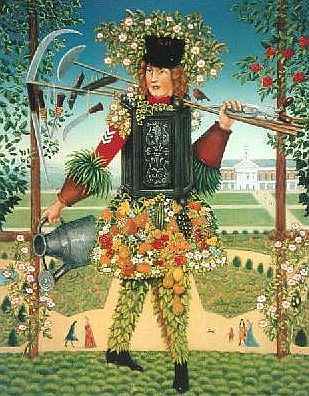 I may have a feeling of bliss when I think of the purity and passionlessness of the growing plant; I can produce within myself the feeling of how certain higher perfections must be purchased through the acquirement of instincts and desires. This can then transform the feeling of bliss, which I have felt previously, into a grave feeling; and then a feeling of liberating joy may stir in me when I surrender myself to the thought of the red blood which, like the red sap of the rose, may become the bearer of inwardly pure experiences. It is of importance that we do not without feeling confront the thoughts that serve to construct such a symbolic visualization. We visualize a black cross. 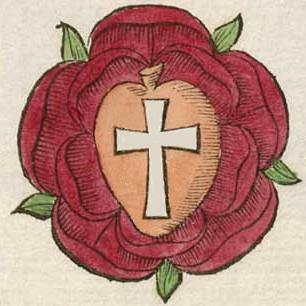 Let this be the symbol of the destroyed base elements of instincts and passions, and at the center, where the arms of the cross intersect, let us visualize seven red, radiant roses arranged in a circle. 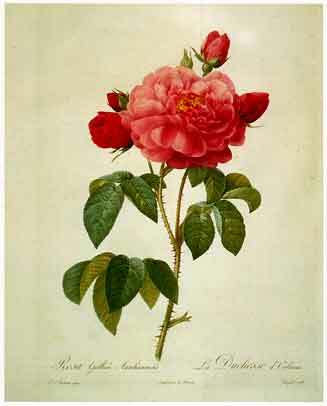 Let these roses be the symbol of a blood that is the expression of purified, cleansed passions and instincts. Such a symbolic visualization should be called forth in the soul in the way illustrated above through a visualized memory image. Such a visualization has a soul-awakening power if we surrender ourselves to it in inward meditation. We must seek to exclude all other thoughts during meditation. 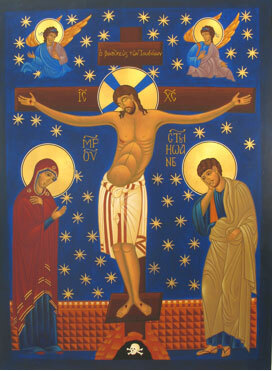 Only the characterized symbol is to hover in spirit before the soul as intensely as possible. 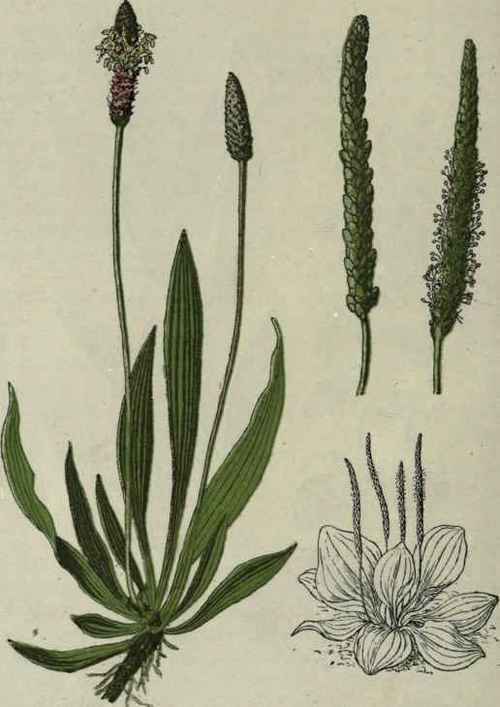 It is not without significance that this symbol is not simply given here as an awakening visualized picture, but that it has first been constructed by means of certain thoughts about plant and man. For the effect of such a symbol depends upon the fact of its having been constructed in the way described before it is employed in inner meditation. If we visualize the symbol without first having fashioned it in our own souls, it remains cold and much less effective than when it has received, through preparation, its soul-illuminating power. During meditation, however, we should not call forth in the soul all the preparatory thoughts, but merely let the visualized picture hover vividly before our inner eye, at the same time letting the feeling hold sway that has appeared as a result of the preparatory thoughts. Thus the symbol becomes a token alongside the feeling-experience, and its effectiveness lies in the dwelling of the soul in this inner experience. The longer we are able to dwell in it without the intervention of other, disturbing, thoughts, the more effective is the entire process. It is well, nevertheless, for us, outside the period dedicated to the actual meditation itself, to repeat the construction of the symbol by means of thoughts and feelings of the above described kind, so that the experience may not fade away. The more patience we exercise in this renewal, the more significant is the symbol for the soul. Among the Initiates it was foreseen that a time would come when because of the gradual increase of knowledge many would be confused in matters of religious faith. Therefore a form of instruction had to be created for those who felt within themselves the discord between faith and knowledge. In the Middle Ages the most learned were also those of the greatest faith and piety; and for a long time afterwards those who had made headway in scientific knowledge could not conceive of any contradictions between knowledge and faith. We are usually told that faith was shaken by the ideas of Copernicus, but that is quite wrong: after all, Copernicus dedicated his book to the Pope! It is only in quite recent times that this conflict has gradually developed. The Masters of Wisdom saw that this was bound to happen and that a new path would have to be found for those whose faith had been destroyed. For persons much occupied with science, the necessary path towards Initiation is the Rosicrucian, for the Rosicrucian method shows that the highest knowledge of mundane things is thoroughly compatible with the highest knowledge of spiritual truths. It is precisely through the Rosicrucian path that those who have been led away from Christian belief by what they take to be science can learn to understand Christianity truly for the first time. 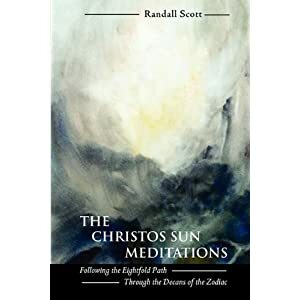 By this method anyone can come to a deeper grasp of the truth of Christianity. Truth is one, but it can be reached along different paths, just as at the foot of a mountain there are various paths, but they all meet at the summit. 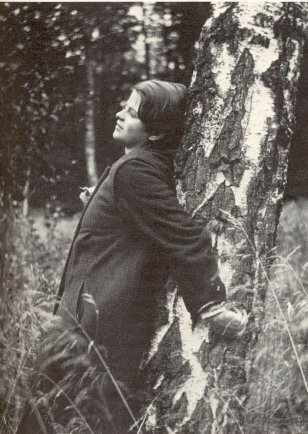 It is clearly a path for just such a one, for instance, as Sophie Magdalena Scholl (9 May 1921 – 22 February 1943) who was executed on this date in 1944, having been convicted of high treason in Hitler’s Third Reich. As a student, Scholl was active within the White Rose, a non-violent resistance group in Nazi Germany. 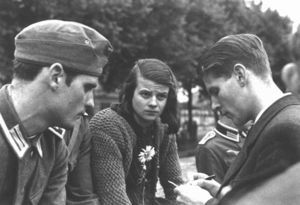 It was after having been found distributing anti-war leaflets at the University of Munich with her brother Hans that she, along with her brother and others of the White Rose, was convicted of high treason. Members of White Rose came from various spiritual backgrounds. Some were devout Roman Catholics. Others were just as devoutly Lutheran. One was a student of anthroposophy, while another considered himself Buddhist. One, having earlier followed his father’s atheistic beliefs, was baptized a Catholic shortly before execution. From the letters between her and her boyfriend, Fritz Hartnagel, we know that she had given two volumes of Cardinal John Henry Newman’s sermons to Hartnagel when he was at battle on the eastern front in May 1942. 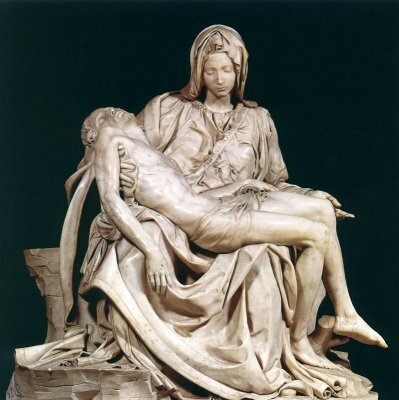 Though she was Lutheran, Scholl and others founded the White Rose after she and the others read a strongly anti-Nazi sermon by Cardinal Clemens August Graf von Galen (the “Lion of Münster”), the Roman Catholic Bishop of Münster. Hartnagel’s reports of the behavior of the Germans on the Eastern Front had horrified her and the others. 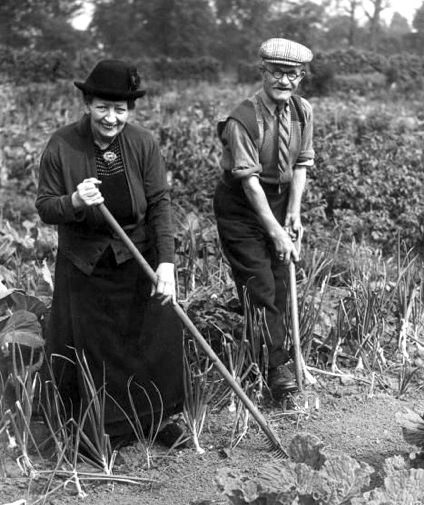 Hartnagel had witnessed Soviet soldiers shot in a pit and had learned of mass killings of Jews. Her correspondence with Hartnagel discussed at great length the “theology of conscience” developed in Newman’s writings. (“It is often said that second thoughts are best,” wrote Newman. “So they are in matters of judgment but not in matters of conscience.”) The transcribed interrogations leading to her “trial” and execution reveal this central concern quite clearly. It constituted her primary defense in that trial. Red rose or white rose, it does not matter, it is the rose, as we have said, that has come to mean for us the deepest that flowers can mean. “Let them receive white wreaths for their good works,” writes Saint Cyprian the Church father, “or red for their suffering. 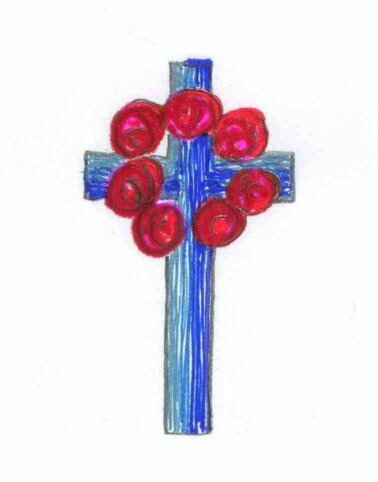 In heaven’s army both peace and war have their own flowers.” And what has the White Rose actually come to mean for us now if not the Holy Grail of the purified soul uniting the rose with the Cross in the sign of the Cross? And that in loving deeds of sacrifice? Especially, we would dare to say, when it comes to painting Sophie Magdalena Scholl. 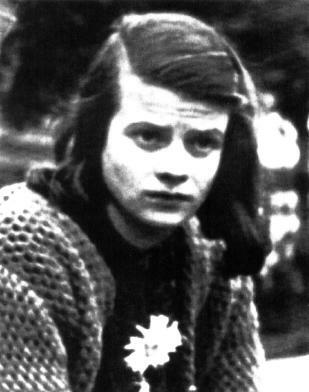 Thank you for remembering Sophie Scholl and The White Rose. Her (their) day of death is my son’s birthday. Courage, hope, faith and love will live on in human beings. Thank you for your wonderful contribution Randall.